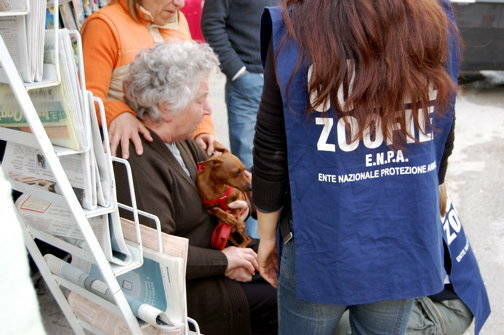 Abruzzo, the Earthquake, Hundreds of Victims...But What About the Animals? There are so many stories connected to an event like an earthquake. There are mostly ordinary stories showing extraordinary behavior, little miracles that often remain in obscurity. Some of them have to do with animals that, like humans, are also victims of the earthquake. For this reason veterinary aid posts are stationed in tents in order to help pets with physical injuries. Their presence is also a distraction for the homeless. are hurt doing this hard job. Giorgina is an American terrier who injured her foreleg while digging, looking for survivors. 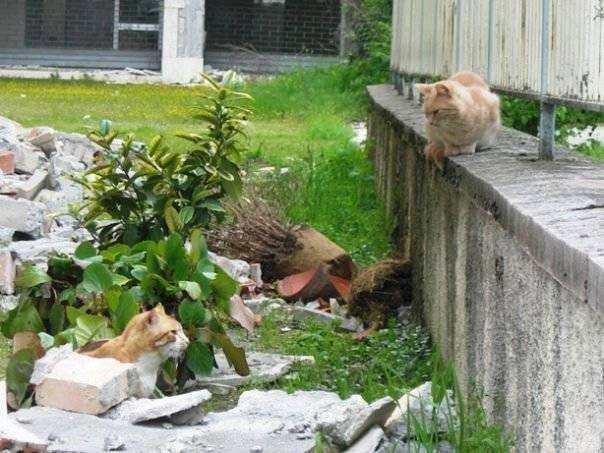 At the veterinary aid posts it’s not unusual to see pets that have fractured limbs during the earthquake, or that are in a state of shock, like the cat Pallina. After the first tremor in the middle of the night, her owner took her and rushed out of the building. Both are now safe, sharing a tent. Since that horrible night, though, Pallina has refused to eat or drink. Every time her owner approaches, Pallina hisses and growls, a behavior that is unusual for a cat that was so affectionate before that horrible night. And there is Briciola, a small, soft ball of fur found under the rubble of the building where she lived, probably with her owners. “Probably” means that there is no information about her life before the earthquake because all the people living there were found dead. Briciola spent six days under the debris living inside a shelter created by a wardrobe. A fireman risked his life to save her, trying to reach the small dog that barked incessantly. Her small size inspired the name the firemen gave her, Briciola. Receiving a new name is a true rebirth and a baptism, the joy of being safe in a new identity and waiting for a new family. Her reactions, though, are the complete opposite of Pallina’s. In fact Briciola is so eager for caresses that she looks for tenderness from every person that approaches her at the Society for the Protection of Animals. There are also stories of owners desperately looking for their pets, like Pierluigi who for eleven days after the first quake had been searching for his dog Toby that fell out of the building where they lived in L’Aquila and disappeared. 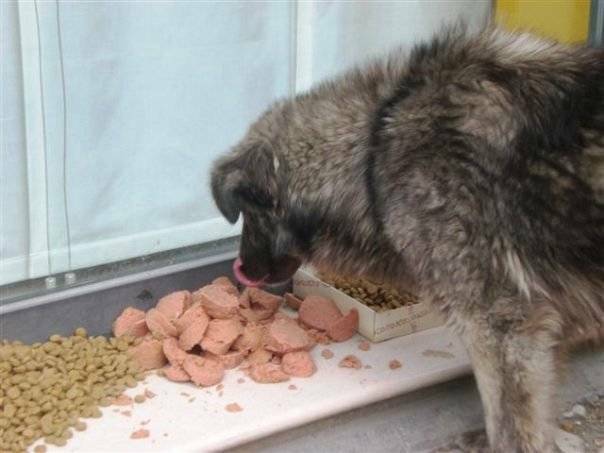 Luckily there’s a happy ending: Toby was found in a dog shelter in Sulmona where all of L’Aquila’s dogs without homes or owners have found refuge. This is a real miracle for Pierluigi, a young father of two daughters who considers Toby’s presence fundamental in helping his two children to recover from the shock after the earthquake. but wandering lost and frightened. There are stories with a happy ending, but there are also those dealing with people who have lost their animals and animals that have lost their owners. Jolanda and Sandrino Tarquini is a couple in their 70s now living in the tent city, whose 10 year old black pincher, Pisolo, died. They could not find a particular medication he needed, and the rain and chill in the tent contributed to his death. “He had a coat but he wasn’t wearing it,” the owner said, while his wife cried. There are also those weird stories such as a man who asked firefighters to accompany him to his apartment located in a hazardous area in the center of L’Aquila, where no is allowed without authorization, in order to feed his iguana. And many people living in the tent city are curious to know what happened to all those exotic, and in some cases dangerous, animals such as snakes and spiders that survived the earthquake but escaped from the cages they were transported in. It is easier to take care of the canaries and parrots that are present in many of the tents since they don’t require a lot of attention. The earthquake involved not only pets living in apartments; many sheep and other farm animals were abandoned and died of starvation because they could not be reached in time. Hundreds of cows and sheep were crushed in collapsed stalls. The generosity of the Italians has helped not only human beings. Trucks full of pet and farm animal food arrived in Abruzzi, along with materials to build kennels, and computer chip readers to identify pets. It’s one more chance to reunite pets with their owners and look for as many happy endings as possible. 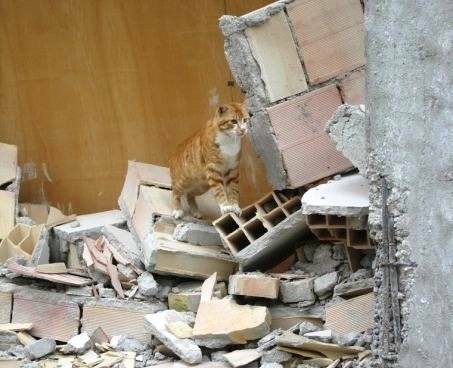 For further information on initiatives to help animals who survived the earthquake in Abruzzi, please visit ENPA's website.